Minneapolis, Minnesota (April 10, 2013) – The 13-county Twin Cities regional housing market has achieved several major accomplishments in recent months and March 2013 was no different. For a 13th consecutive month, homes sold at a higher median price than during the prior year. Additionally, the percentage of all new listings that were traditional, non-distressed homes rose to 75.0 percent, its highest level since May 2008. Several patterns continued from 2012, including increased pending sales, decreased inventory, higher prices and a lighter distressed market. There were 3,632 closed sales in March 2013, which was roughly even with last year. There were 4,656 pending sales, a 6.6 percent increase over 2012. 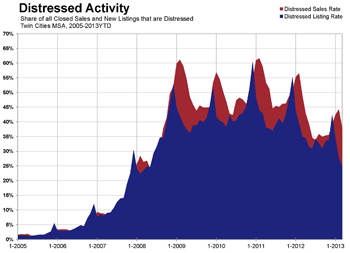 Inventory levels declined 31.0 percent to 12,615 active listings, marking a new 10-year low. Driven by the changing mix of sales, the median price for the Twin Cities metro rose 17.4 percent to $176,000. More product sold at higher price points. Although seller activity was down 5.0 percent in the metro area, traditional new listings were up 9.7 percent; foreclosure new listings were down 26.6 percent; short sale new listings were down 42.0 percent. Since traditional homes sell for about 55.0 percent more than foreclosures, median sales price rose 17.4 percent compared to last year. The 10K Housing Value Index – which controls for data variability – showed a 10.5 percent increase to $182,378. More seller participation in the market will be crucial to ongoing recovery, as many consumers are frustrated by the limited supply of homes for sale. There is evidence that this is improving, as traditional seller activity has been on the rise lately. Traditional homes represented more than 62.0 percent of all closed sales. Distressed properties made up the remaining 38.0 percent. The traditional median sales price was up 6.1 percent to $209,900; the foreclosure median sales price was up 28.5 percent to $134,900; the short sale median sales price was down 3.0 percent to $130,000.